A macaron (also known in Australia as ‘macaroon’) is a sweet prepared in many regions of France. 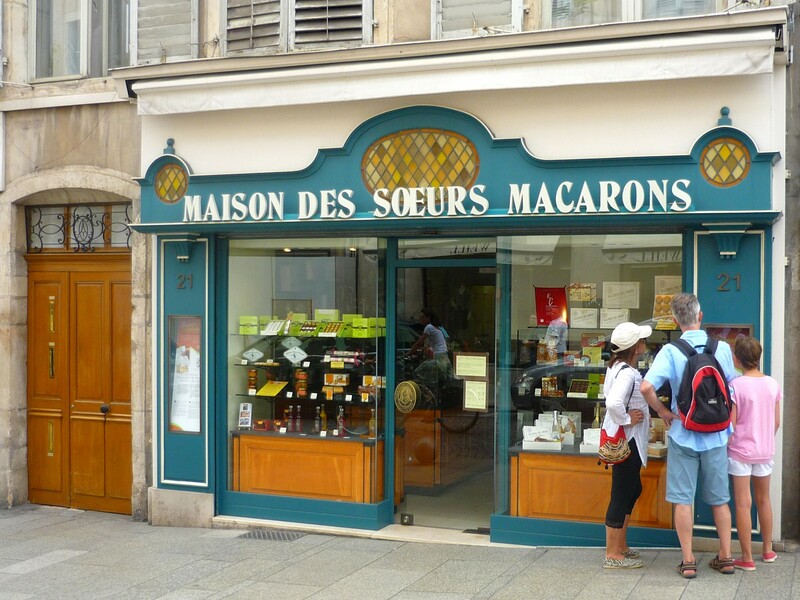 In Nancy, Lorraine, macarons have been part of the local history since the time of the French Revolution. More elaborate, the Paris version is filled with a layer of buttercream or ganache between two almond meringue discs. Macarons are derived from the italian word “maccarone” or “maccherone” which evokes the crushing or beating of the almond paste which constitues its main ingredient. In Nancy, Lorraine, macarons have been part of the local history since the time of the French Revolution (18th C) when two nuns created the famous delicacy. But many other French places claim its paternity: Boulay (Lorraine), Rouen, St Jean de Luz (Basque Country), without forgetting St Emilion, Amiens, Montmorillon, Le Dorat, Sault, Cormery, and Joyeuse. 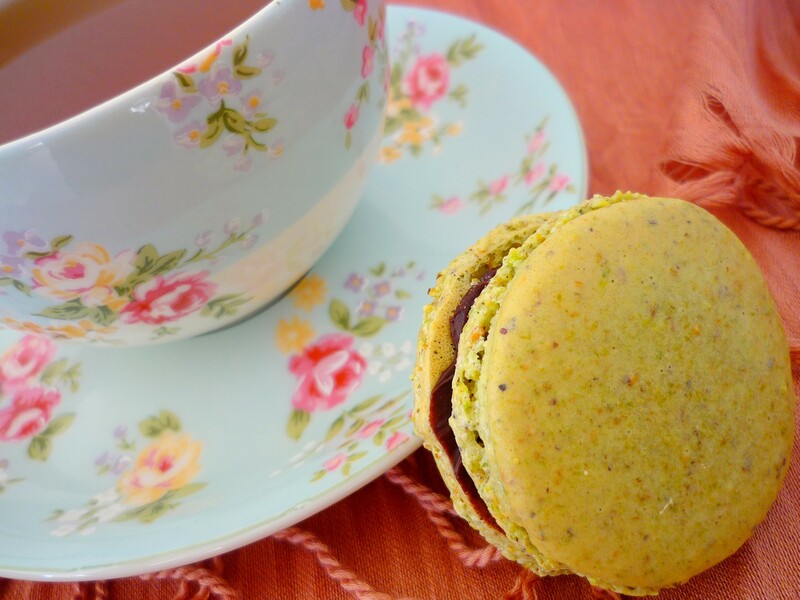 More elaborate, the Paris macarons were created by Pierre Desfontaines of La Durée. They are filled with a layer of buttercream or ganache between two almond meringue discs. The range of flavours are unlimited: chocolate, raspberry, coffee, liquorice, raspberry, etc. 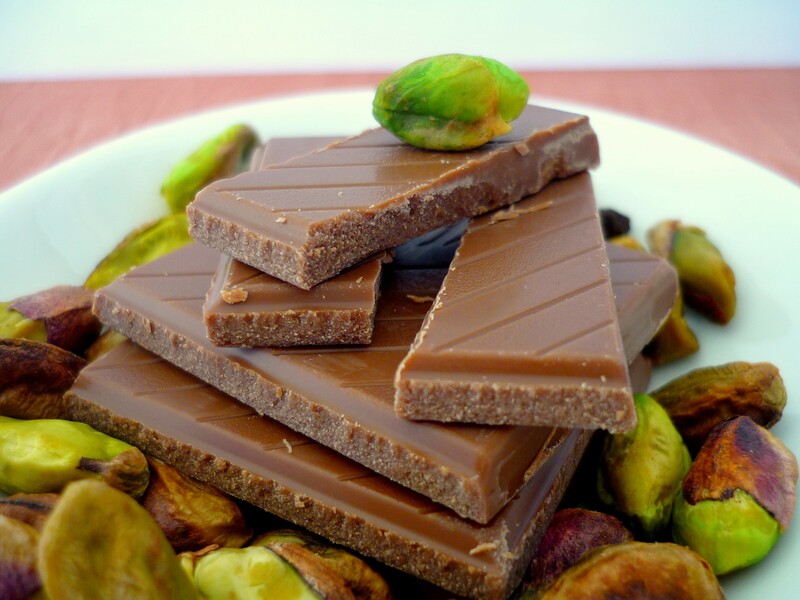 The recipe that we are posting uses chocolate and pistachios. Weigh the pistachios and then blend them as fine as possible. Re-weigh and then sieve twice. Weigh the icing sugar and sieve twice. Mix the ground pistachios and icing sugar together in a bowl. Weigh the egg whites and place in a large mixing bowl. Whisk the egg whites until they form peaks then add the caster sugar three times, whisking non-stop until the meringue forms firm peaks and is glossy. Add the icing sugar and pistachio mixture all at once into the meringue mixture and carefully fold in using a spatula. 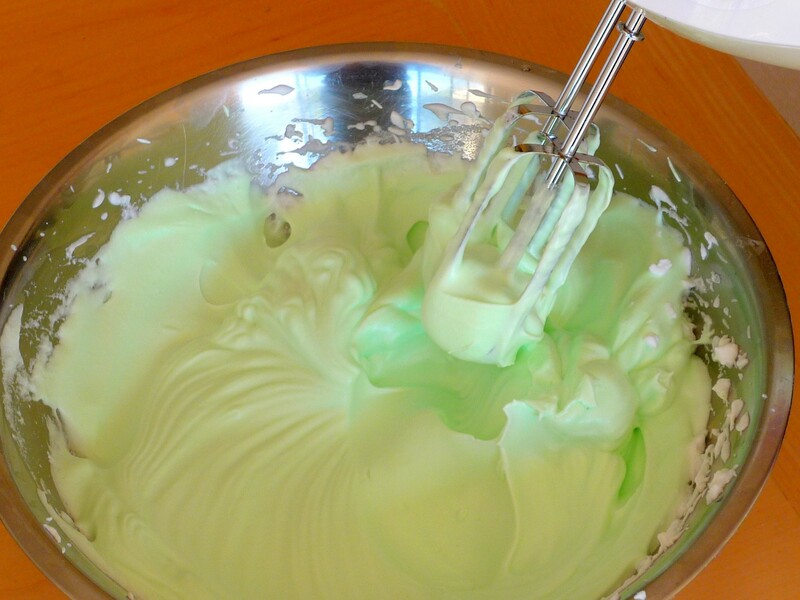 Add 8-10 drops of green food colouring to obtain a light green colour in the mixture then beat the mixture a little more energetically – the texture should be soft but not runny, glossy and smooth. When you lift up the mixture on the spatuala the mixture should take about 20 seconds to go back into the bowl. Put the mixture into a pipping bag and pipe small rounds of about 2.5cm diameter onto trays lined with baking paper, making sure there is at least a space of 3 cm between each of them. 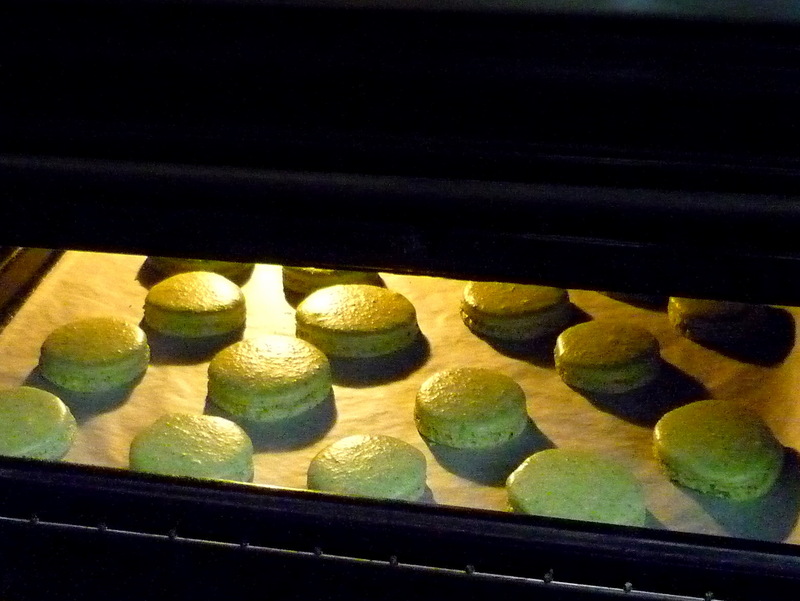 dress macarons husks on baking papers laid on a baking trays/oven racks. Leave them somewhere dry and warm to form a slight crust “croquer” which should take about 60 minutes. Preheat the oven to 150˚C and bake them for about ten minutes (you will have to check them regularly, making sure that they don’t burn or brown but that they have risen enough). They are cooked when the bottom has formed a crisp layer but should not be browned or coloured. Once they are cooked, let them cool off on the tray for 10 to 15 minutes to allow them time to harden a little. You can then peel them off and when completely cool turn them over ready for the “sandwiching stage”. Pour the cream into a saucepan until it reaches a gentle simmer. Break the chocolate into small pieces in a bowl and then gradually pour the boiling cream over it, whisking energetically the whole time to create a thick glossy ganache. Add the cubes of butter one at a time whilst continuing to beat the chocolate mixture. Put in the fridge whilst the macaron shells are cooking/cooling. Take a macaron disk with its hard, flat side facing upwards and spread a teaspoon of chocolate ganche in the middle of it. Take another disk and sandwich it on top of the ganach. Push gently (being careful not to crush it!) 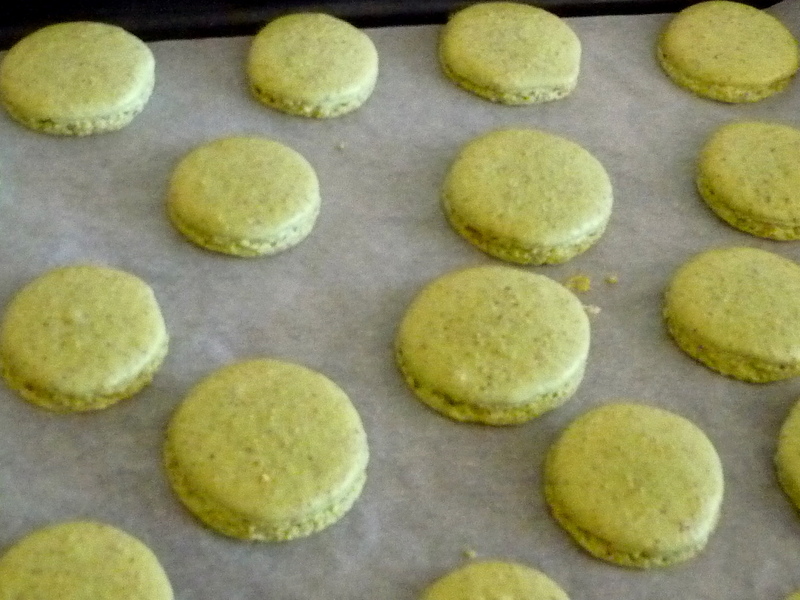 to evenly distribute the ganache in between the two disks .. and voila … the macaron is ready! 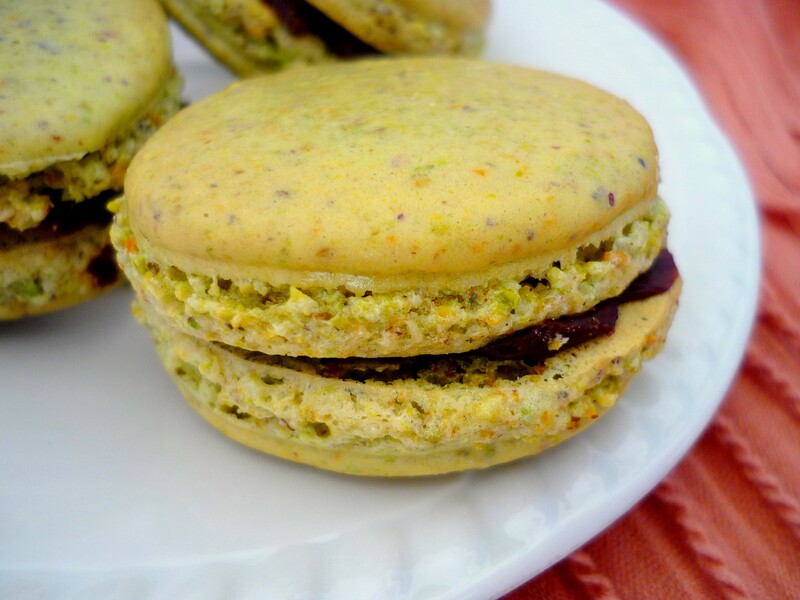 Most macaron recipes use almonds as the base and most pistachio macarons will be made with a coloured almond based mixture with a butter cream filling that is flavoured with pistachio paste. As it is hard to find that ingredient in Australia we have put the pistachios in the actual meringue mix of the shells which gives a slightly more grainy texture than if using almond meal. When making macarons it is important that the weights are exact and that everything is sieved and mixed correctly … there are no shortcuts! Macarons can be served on their own with a tea or coffee, or as part of a more elaborate dessert with fruits or with ice cream. You may want to add a sprinkling of cocoa powder or icing sugar depending on the flavour. 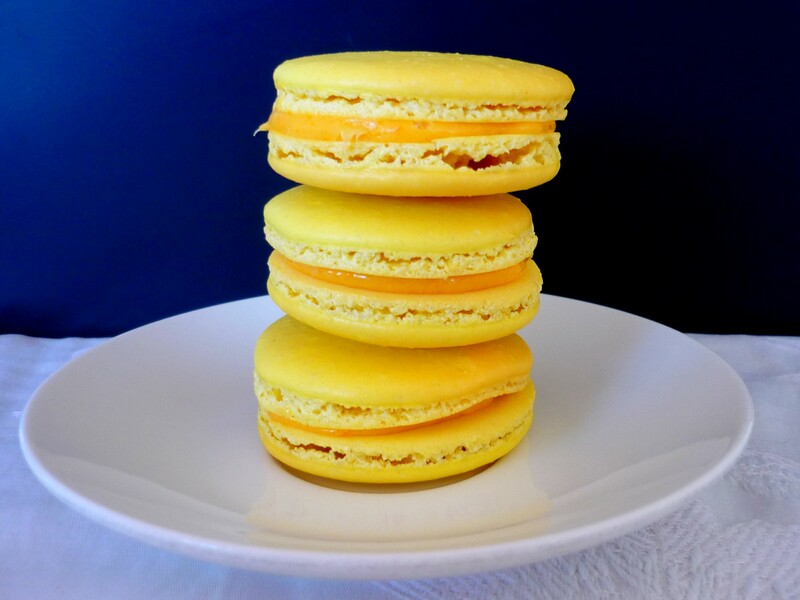 There are many variations of this delicious “little sin” (péché mignon) … and you can even make savoury ones … more macaron recipes will follow soon! Keep in an airtight box for 24 hours in the fridge (if they last that long!) or freeze them. Macraons freeze well and are a beautiful little treat to have on hand for unexpected guests … !